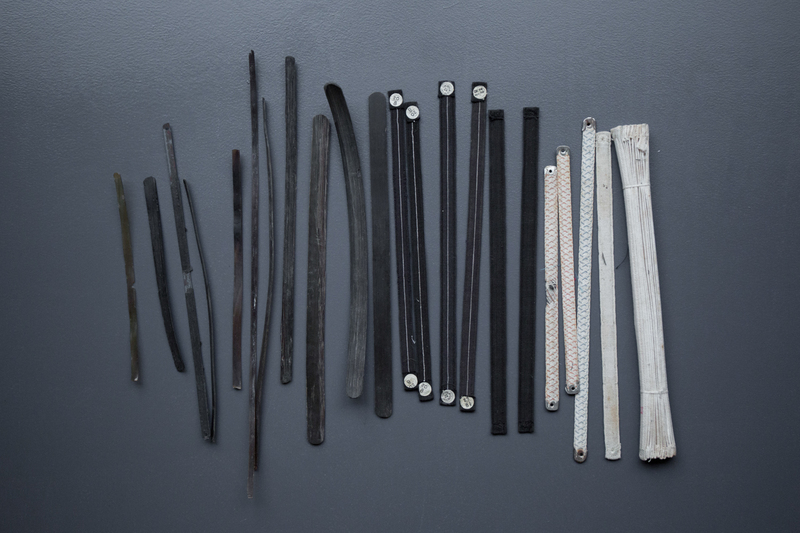 An assortment of baleen and steel bones, most commonly used to support corsets and some structured outer clothing in the 19th and early 20th century. The left side of the image shows a variety of thickness of baleen, also commonly referred to as whalebone. Baleen is made from the feeding filter from the mouth of the Baleen whale, made of keratin (the same substance that makes up human nails and hair). It’s an incredibly flexible but lightweight fibre, hence its popularity for giving structure to garments. Demand for baleen led to the overslaughter of the whales in the late 19th century, leading to a shortage of the material. As baleen got more expensive, corset makers began to use other, cheaper substitutes including spiral and flat steel, coraline (a fibre made from the Mexican Ixtle plant), featherbone (with the quills of feathers bound with textile), cane and cording. The baleen whale is now endangered and the trade of baleen goods is highly restricted. The bones on the right side of the image are a mix of flat steel and spiral steel (the latter made by steel wires being coiled together for a bone that has strength and flexiblity), encased in cotton channels. Steel bones eventually became the bone of choice for corsetry and is still one of the most popular structure choices to this day. Adverts keep The Underpinnings Museum running! Please consider visiting our sponsors if you enjoy this website. © Copyright 2018, The Underpinnings Museum. All Rights Reserved.